How Do You Like Them Apples? | Yobot Inc. Continuing on with the living room theme, and sharing our living room vision, and a little bit about the family. My dad is a very skilled carpenter. We have three custom-made wooden lamps in our house that he created, and one of them is in our orange living room near the front door. We like this wooden lamp on the wooden bookcase, brings a warm feeling into the modern living room. 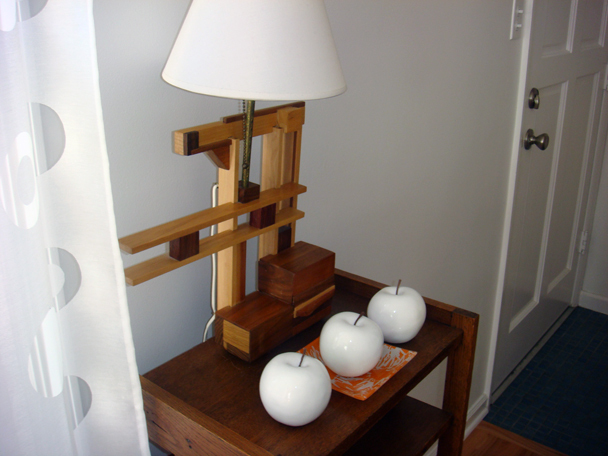 The lamp has a Frank Lloyd Wright feel too, which we love. 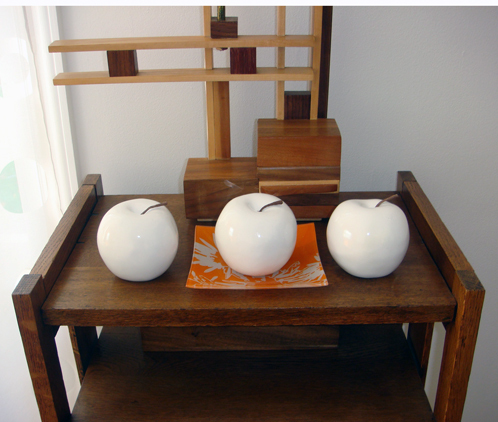 You may be thinking what are those round white apples in front of the cool lamp? Well, they are round white apples. It’s my first attempt with something purely in the name of “home decor”. I don’t really know how to decorate, but I liked these apples, and the white of the apples matched our new living room walls. the better to match the orange wall. Does it work? Or are the apples superfluous?